Hi, thanks for stopping by. I’m Donald L. Robertson, a writer of Western novels and short stories. 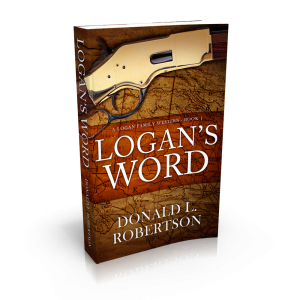 My first book, Logan’s Word, A Logan Family Western – Book 1, was published when I was 72 years old. You’re never too old, or young, to pursue your dream. As the name implies, Logan’s Word is the first of a series following the Logan family as they face the challenges of moving west in the mid to late 1800s. Sign up for my newsletter, to your right, and you will receive the short story, The Old Ranger, notification of discounts, and release dates. You won’t get a bunch of junk in your inbox. If you’ve already read Logan’s Word, I would appreciate it if you would take a moment and leave a review on Amazon.